Festivals - Kuttanad "The land of backwaters" "KUTTANAD"
Kuttanad "The land of backwaters"
Home to a large number of temples, churches and mosques, Kerala serves as a wonderful example of unity in diversity. Here, different festivals are celebrated year-round. Let it be temple festivals, carnivals of churches or any other ceremonious occasion - every festive occasion in Kerala is celebrated with much pomp and gaiety. The colorful festivals in Kerala show the spirit of the people. Onam, the state festival, is celebrated by people of all religions and communities with zeal and enthusiasm. On the other hand, religious festivals like Diwali, Christmas, Mahashivaratri, Bakrid, Id-ul-Fitr and Easter are celebrated with equal fun and fervor. Vishu is a very popular festival among Hindus and is celebrated all over India with different names. It is called Bihu in Assam, Puthandu in Tamil Nadu and Baisakhi in Punjab. It is celebrated on the first day of the Malayalam calendar i.e. April 14th. People of Kerala believe that the first person visiting their houses in the morning on Vishu will influence their fortunes for the coming year. It is the reason they prepare a ‘Kani’, which they see in early morning. Kani comprises of gold ornaments, a white cloth, bell metal mirror, flowers of the Konna tree, jack fruits, coconuts, and two standing oil lamps. Mahasivarathri is an important Hindu festival celebrated during the month of Kumbham (Feb-March). According to the legends, on this day Lord Shiva saved the world by drinking the deadly poison obtained from the sea. On this day devotees gather at Shiva temples across the state and offer special Pooja and Abhishekham. Navarathri is an auspicious festival for Hindus. It is celebrated for nine days in the month of October. During Navarathri in Kerala, people perform Saraswati Pooja and Ayudha Pooja. On Durgashtami, the eighth day, a special ceremony is performed called Poojavaipu. It is followed by special Poojas on Ninth and Tenth day. Diwali is the festival of lights, celebrated all over the country with great fervor and enthusiasm. It commemorates the return of Lord Rama after an exile of 14 years. On this occasion, people decorate their houses, lit oil lamps and exchange sweets. Diwali celebrations begin in the evening in northern parts of India, while in Kerala, people follow the rituals of the festival in the morning. Asthami Rohini or Janmashtami festival commemorates the birth of Lord Krishna. It is celebrated in the month of Chingam, which falls in Aug- Sep. On this day, devotees visit temples and offer prayers. Celebrated on 25 December every year, Christmas commemorates the birth of Jesus Christ. It is celebrated all over the world with great enthusiasm and zeal. Churches in Kerala arrange holy masses and special prayers for the occasion. On this day, people decorate Christmas tree, sing Christmas carols and exchange greetings and gifts. Churches also hold annual feasts on this occasion. Easter is celebrated to commemorate the resurrection of Jesus Christ. It holds a special place in festivals of Christian communities. Churches in Kerala hold midnight masses on this occasion. Bakrid, known as Bali Perunnal or Valiya Perunnal in Malayalam, is an important festival for Muslims. It is celebrated all around the world. The festival celebrates the readiness of Ibrahim to sacrifice his son following Allah’s command. During this festival, Muslims in Kerala offer prayers and sacrifice goats and distribute it. Id -Ul- Fitr, which is known as Cheriya Perunnal in Malayalam, is one of the most important festivals for Muslims. It celebrates the culmination of the holy month of Ramzan, when Muslims indulge themselves into stringent fasts (Roza). The sacred month of Ramzan includes refraining from eating and drinking during day time. Kerala has a significant population of Muslims, which celebrates this festival with lavish feasts and merry making. Onam is the most important festival of Kerala. Celebrated annually in the month of Chingam (August-September), Onam is a harvest festival. Wearing new clothes and feasting on the traditional lip smacking delicacies of Kerala are the highlights of the festival. According to the legends, Onam is celebrated on the arrival of King Mahabali, who once ruled Kerala and was sent to ‘Patalam’ by Vamana, an avatar of Lord Vishnu. It is believed that King Mahabali returns to Kerala to see his beloved people. On this occasion people decorate their houses. One can see intricate floral Rangoli called Pookkalam laid at the verandah of every household, during the festival. 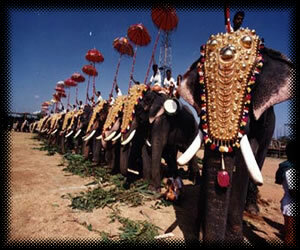 It is a perfect occasion in Kerala for families to get back to their relatives and friends. For more check "Festival calender of Kerala"